Do your teeth hurt when you eat or drink hot, cold or spicy foods, or breathe in cold air? If so, you might need some home remedies for sensitive teeth. Here are some ways you can help alleviate painful teeth at home. First, let’s look at some of the causes of sensitive teeth. Teeth have a covering of enamel, the strongest substance in the human body. And below the gum line, the tooth’s root is protected by cementum. Under both of these lies the dentin. When the dentin loses these layers of protective coating, hot, cold or acidic foods can stimulate the nerves inside the tooth. It is a quite common condition—a survey by the American Dental Association reports that 1 in 8 Americans have sensitive teeth. Often, tooth sensitivity is caused by our behaviors. Brushing too hard, or using a toothbrush whose bristles are too hard can wear away dental enamel. Other causes include receding gums, gingivitis, cracked teeth, grinding or clenching of teeth, plaque buildup, or long-term use of mouthwashes with acids, reports the Cleveland Clinic. Other causes include eating spicy foods, tooth whitening, and sensitivity following dental procedures. If you have sensitive teeth, what can you do to alleviate the pain at home? • Rinse with salt water. 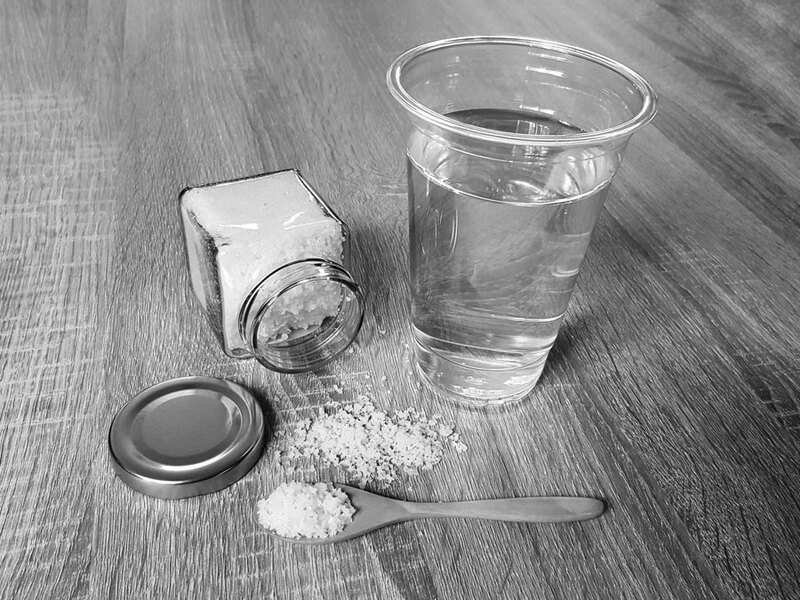 Salt can act as an antiseptic and an inflammation reducer. Rinse twice daily with a lukewarm salt water solution. • Rinse with hydrogen peroxide. With antiseptic qualities, hydrogen peroxide can help heal gums and reduce inflammation. Use a 50-50 combination of hydrogen peroxide and water and rinse your mouth out afterwards. • Use a desensitizing toothpaste. Purchase a toothpaste like Sensodyne or Paradontax that contains potassium nitrate to help block pain signals to the brain. Always use a soft-bristled brush and brush gently. • Limit acidic foods. Foods that are highly acidic like fruits, fruit juices, sugar, processed foods, sodas, tomatoes, coffee, and even high-protein foods lower the pH levels in your body, creating an acidic environment. • Keep your mouth clean. Good oral hygiene, including brushing twice daily and flossing once daily, goes a long way in preventing tooth sensitivity from sticky or lodged food or plaque buildup. • Schedule regular dental visits. Seeing your dentist regularly for both professional cleaning and checkups is essential to maintaining good dental health. Ongoing tooth sensitivity can be annoying, but these home remedies can help. If, however, you experience a severe pain or sudden sensitivity in a tooth, contact your dentist immediately. You may have a cracked tooth, or some other damage may have been caused. The sooner we find out the cause, the sooner we can provide treatment—and prevent a more serious condition that could result in the loss of a tooth. At Advanced Family Dentistry, we want to know if you are experiencing problems like sensitive teeth. This way we can explore the problem and hopefully find a helpful solution. We can also add it to your record and be extra-sensitive with your ongoing dental care. Feel free to talk with us about any tooth sensitivity. We may also be able to provide you with some helpful home remedies for sensitive teeth because we certainly don’t want to see you in any pain! Your dental care is important to us. When you need a family dentist in the Reston or Northern Virginia area, contact Advanced Family Dentistry. We maintain a state-of-the-art dental office and like to share our knowledge with our patients to provide excellent dental care at all times. Most insurances accepted, and senior and military discounts available.